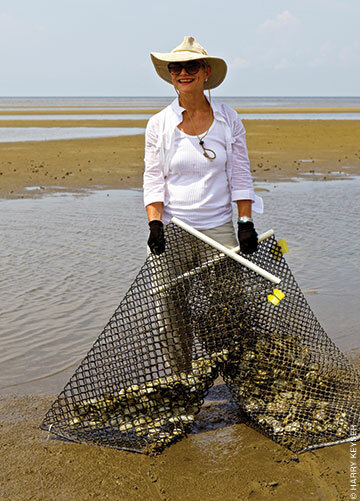 Class of ’78 | Before she became an oyster farmer, Stephanie Tramdack Cash WG’78 rarely noticed the tides. Now she’s keenly attuned to them—especially when she’s out wading in the Delaware Bay, bagging mollusks on her aquatic lease, examining each oyster for imperfections and size—and the water begins to slosh higher and higher. “You have to get out of there!” she says. If she stays too long, her hip boots could fill with water—among other perils. Not long ago her husband, Richard, went after a lost oyster bag only to discover the tide was changing. He wasn’t sure he’d make it back, and he’s the stronger swimmer of the two. Three years into running Dias Creek Oyster Company, Cash has found herself organizing everything around those tides. The meetings are different, too. Sit-downs with her local oyster cooperative or the US Fish and Wildlife Service have replaced the ones she had as a land-locked financial strategist, then a language instructor, and eventually a French-to-English translator. Cash left her desk in 2012 to start oyster farming with Richard. The couple had lived in Cape May Court House for 22 years by then, and a local friend had offered them his 100-acre aquatic lease. “We felt like it would be a crime not to use this resource,” Cash says of the hand-me-down aqua-lease. She’d also noticed that new oyster bars were opening, and local shops had more and more varieties for sale. The East Coast Shellfish Growers Association estimates that there are more than 400 niche oyster brands on the East Coast alone, and that production has doubled over the last five years. Dias Creek Oyster Company is on the New Jersey side of the Delaware Bay, about eight miles from the Atlantic. Cash says the wetlands water and ocean salt combine to make a memorable mollusk: “sweetness and truffly earthiness.” She’s dubbed them Venus oysters. They start as seeds in the Rutgers Aquaculture Innovation Center and come to Dias Creek at a miniscule two millimeters. The Cashes put them inside bags, hang them on racks in the bay, and raise them to be plump and big—but not too big. Their oyster population ranges from about 50,000 up to 130,000 at any given time. She’s also immersed herself in the local oystering scene. As interim chair of the Cape May Oyster Cooperative, she works on marketing issues and farming dilemmas—and red tape. She’s hopeful that a simpler system will eventually emerge. But in the meantime, it’s easy to forget about the legal hassles when she’s out in the water, with only herons and egrets and tiny black snails for company.